A few days ago, I finished Louise Stacpoole-Kenney's "St Francis de Sales" which I took with me to Lourdes to read at various points on the journey to and fro. His "Introduction to the Devout Life" is one of my favourite spiritual books. I read it when I was 17 and it was a great help in my developing vocation to the priesthood. He was very different from St Charles Borromeo who had to act with severity to restore discipline in Milan, and St Robert Bellarmine who was pivotal in educating the apostles of the counter-reformation. One thing he shared in common with both of them was his attitude to episcopal dignity. All three of them preserved the outward trappings of their office in public in order to uphold the rights of the Church. yet they all lived simply in their own private quarters, keeping a disciplined rule of life and living simply, fasting and undertaking significant corporal mortification. A characteristic saying of St Francis de Sales was "Ask nothing and refuse nothing." He would not seek comfort or luxury yet he would accommodate himself to the society in which he was obliged to participate. Where necessary, he would partake in banquets and the like, but personally he preferred to live austerely. He is a great example for those of us who live in the world but struggle not to be of the world. 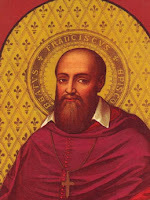 St Francis de Sales. Pray for us.